Pressure cookers are heavy, sealable pots. They are designed to cook food quickly at high temperatures by using the pressure created by enclosing the steam. Most pressure cookers have thick bottoms and attachable lids, making them ideal vessels for cooking popcorn. However, when cooking popcorn in a pressure cooker, make sure to leave a way for the steam to escape so pressure does not build up the way it does when pressure cooking. Set your pressure cooker to not retain pressure by opening the gasket, air vent or pressure lock. If this is not possible given the design of your pressure cooker, find a lid from a regular cooking pot that will fit on top of your pressure cooker. If you cannot set your cooker to release pressure or find a similarly-sized lid, use your pressure cooker with the lid off. Pour the oil in to the pressure cooker and place the cooker on a stove burner set to medium-high heat. Drop three popcorn kernels into the pressure cooker once the oil is hot. Add the rest of the popcorn once the three kernels have popped. If you are using the lid from the pressure cooker, attach it now. If using the lid from another pot, place it over the pot of the pressure cooker now. Shake the pressure cooker continuously while the new kernels pop, but be careful to not spill the hot oil. If using the lid from the pressure cooker, you may shake vigorously because it fits on the cooker properly. 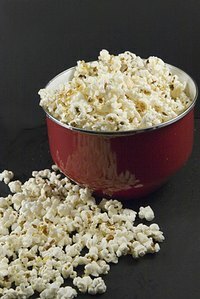 If using the lid from another pot or without a lid, shake gently so that the popcorn and oil does not leave the container. Remove the pot from the heat when you hear a five second silence between pops. Open the lid and pour your popcorn into a bowl. Taste of Home: Popcorn in the Pressure Cooker? Deccan Herald: Corny about Popcorn?